Best in Class heating option available. All-in, all things considered the best electrical heating source available. 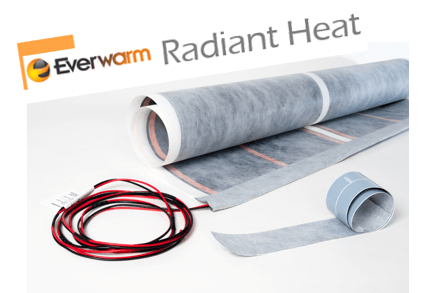 Beyond best-in class electric radiant heat. Notably the best of all Radiant Heat Options. Dual Voltage Applications - The same film can be used for 120 or 240 volt installation. Superior Quality Materials and Construction - Made from tough polyethylene (PET), polypropylene and proprietary resistive Nanotechnology carbon heating compound, with manufacturing quality controls adhering to ISO 9001 standards since 1992. Safe and Comfortable FAR-Infrared Heating - Produces safe, healthy and comfortable FAR-infrared rays which heat objects in the room, not the air. The very low EMF levels, over 1,000 times lower than the OSHA (Occupation Safety) standard limit for concern, make the film completely suitable for use domestic and commercial. Less Power Consumption and More Cost Savings - Uses the latest advancements in Nano-technology to increase the resistance in the carbon element, and thereby decrease the power demand. Versatile Heating Option - Can be installed under carpet, tiles, stone, marble, slate, laminate and wood flooring. Works anywhere in the house; living room, kitchen, bathroom, bedroom, mudroom, basement, garage, roofs, driveways, walkways, etc. The film is fit for use in wet applications. Least Complicated Heating System - Works efficiently without any operational or maintenance issues. The film is tough, built to last, and doesn’t break easily. Easy Installation - Quick and easy installation, can be done even by a novice homeowner. No floor build up, ductwork or mechanical room required. Hassle-free Repair Work – Should accidents happen, the film’s material is easily repaired. Usually, the damage can be located and fixed without replacing the entire film. Even Heating, No Hotspots - The film heats evenly across the entire surface eliminating the problem of hot spots.